Robert Lennox is a PhD student at Carleton University. 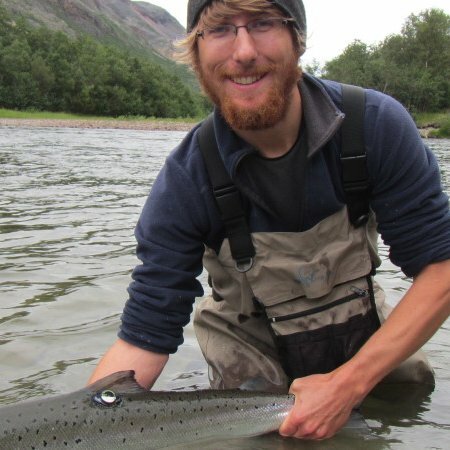 He is working on Atlantic salmon migration in Norway in Steve Cooke’s lab (more info). He is also an avid naturalist with a special interest in birds. Every winter the first snowfall brings out an army of trucks, ploughing – and heavily salting – Ottawa’s streets and highways to keep them safe. But safety comes at a price. Not only does it coat our cars and boots, we apply so much road salt in Canada (5,000,000 tonnes a year) that it creates environmental risks. Much of the salt eventually finds its way by meltwater into local water bodies. There, it poses a risk to fish, freshwater ecosystems, plants, and animals that normally regulate the amount of salt in their bodies but are not adapted to saline water and cannot function properly in it (Rosenberry et al. 1999, Kelly et al. 2007, Environment Canada 2015). Salt is toxic to wood frog larvae, which live in ponds throughout North America. If these larvae are exposed to salt for long periods they take longer to metamorphose into adult frogs, have physical abnormalities and reduced activity, weight, and survivability (Karakker et al. 2008, Sanzo and Hecnar 2006). 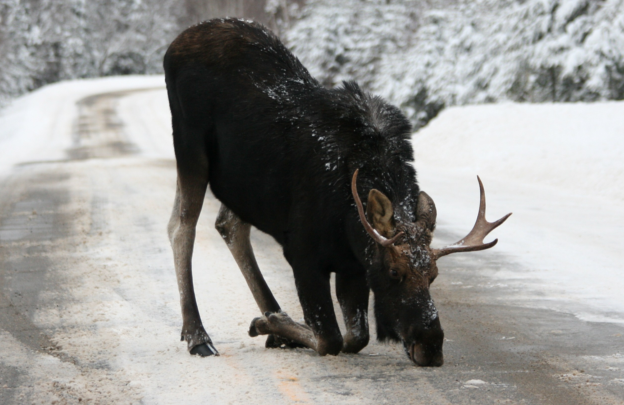 Large species, such as moose, and small winter finches in the Fringillidae family are attracted to road edges where they can satisfy their salt requirements. However, the downside is they may be struck by passing vehicles (Mineau and Brownlee 2005). To reduce the environmental impact of road salt, most municipalities have adopted the 2004 national code of practice for organizations that apply more than 500 tonnes of salt a year. The code includes measures for salt storage (under cover and on an impermeable pad), application equipment and techniques, and salt vulnerable areas (identifying, monitoring and protecting areas that may be particularly sensitive to road salts). 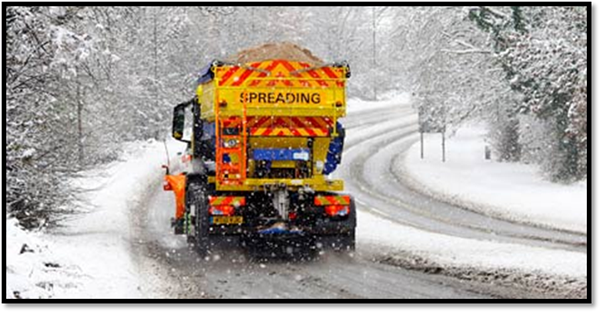 Recently, Environment Canada reviewed the effectiveness of the code and set national targets for improved road salt management, notably, an increase in the number of road organizations that identify salt vulnerable areas and prepare an action plan for them. What can we do? Some cities are testing creative solutions, including using garlic salt, cheese brine, and molasses (see news story) as alternatives to road salt on city streets and highways. At home you can try sprinkling sand on your icy paths and walkways, or save and spread some ashes from the yule log (see Road salts and alternatives). Maybe these can be practical solutions for you. Environment Canada. Road salts. January 8, 2015. Karraker, N.E., Gibbs, J.P., Vonesh, J.R. 2008. Impacts of road deicing salt on the demography of vernal pool-breeding amphibians. Ecological Applications 18(3): 724-734. Kelly, V.R., Lovett, G.M., Weathers, K.C., Findlay, S.E., Strayer, D.L., Burns, D.J., Likens, G.E. 2007. Long-term sodium chloride retention in a rural watershed: legacy effects of road salt on streamwater concentration. Environmental Science & Technology 42(2): 410-415. Sanzo, D., Hecnar, S.J. 2006. Effects of road de-icing salt (NaCl) on larval wood frogs (Rana sylvatica). Environmental Pollution 140(2): 247-256. Last week post-doctoral researcher Dr. Jon Midwood led a group of volunteers from the FECPL lab and Ottawa community on a hunt for juvenile Muskellunge and Northern Pike in the Rideau River. Ottawa can boast about its urban muskie population in the Rideau river, which winds through the city and provides unique habitat where both muskie and pike populations exist. 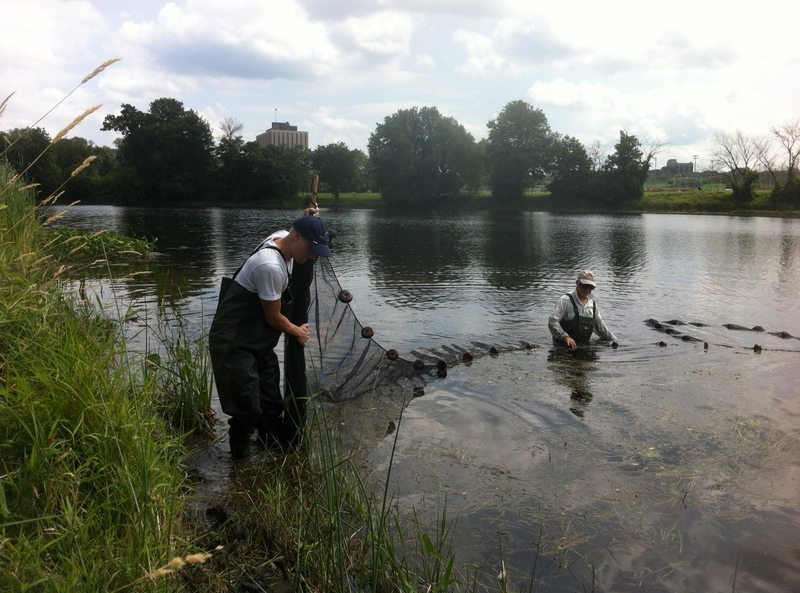 Volunteers seining the Rideau River for juvenile esocids. 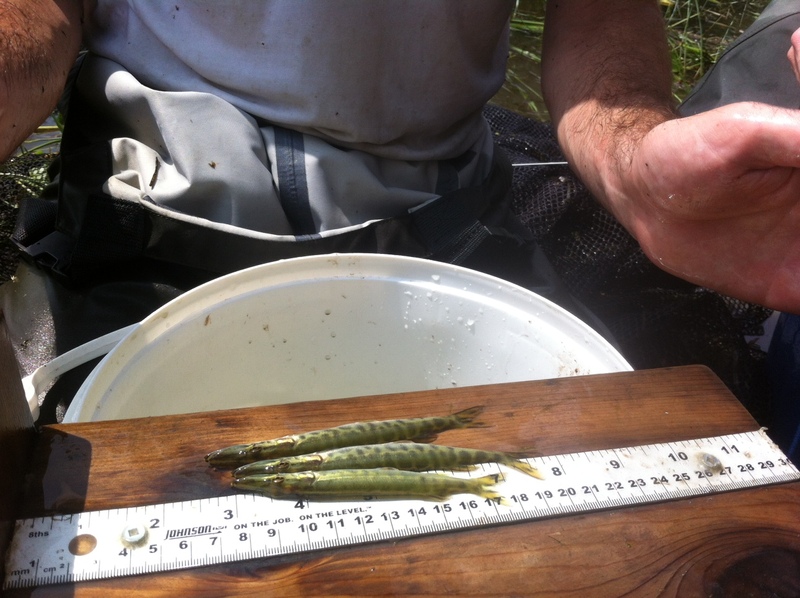 There is currently an active tracking project for adult muskie and pike in the Rideau River (click here to read about the Brewer Pond project), but the last time surveys were conducted for the juvenile fish was in 1999. With the International Muskellunge Symposium fast approaching (at Carleton, August 14th & 15th) and the Brewer Park Pond habitat creation project slated to break ground in mid-August, it seemed like a perfect time to get back out there to sample. In association with Rideau Valley Conservation Authority (RCVA) and the Ottawa Chapter of Muskies Canada, FECPL members seined 12 sites on July 21st and 22nd. The main objectives were to 1) confirm muskies are still successfully spawning by finding young-of-year (YOY) and 2) determine if habitats near Brewer Pond are being used as nursery habitat by these YOY. The surveys were a success. In the 12 sites that were seined, we found 14 juvenile muskies (averaging 10 cm in length) and 1 juvenile pike (130 cm in length). Esocids (either pike or muskie) were found in 8 of the 12 sites. It was especially gratifying since most of the volunteers seining ended up wading past the chest wader line and becoming thoroughly wet. Luckily it was a hot week so a thorough soaking was welcome despite the damp commute home. Well worth it! Three young-of-year muskies caught in a seine haul in the Rideau River near Brewer Pond. Of course numerous other species were caught, including juvenile and adult Rock Bass, Pumpkinseed, Smallmouth Bass, Largemouth Bass, Walleye, Yellow Perch, as well as Golden Shiners, Blackchin Shiners, and some adult Northern Pike (a nice surprise to find in a seine net!). It was great to see the high level of recruitment of juvenile fish, especially in some of the embayments near Bronson St. Bridge that were created a decade ago for fish nursery habitat by the Ottawa Chapter of Muskies Canada in conjunction with RVCA/City of Ottawa. So what does this tell us? First, it seems that muskies are successfully spawning in the Rideau River, and secondly, the habitats near Brewer Park Pond are being used as nursery habitat. Armed with this knowledge, it may be possible to link the tracking data from the spawning season with the locations where muskies were found to help narrow in on potential spawning locations. Also, the presence of YOY muskies near Brewer Park Pond means that habitat remediation and creation work slated for late this summer will take place near an existing population. This population might be able to serve as a source for colonization of the newly created habitat (fingers crossed). Members of FECPL ignoring hip-wader height!